Home › Editing › Style guides for the 21st century (part 1): What is a style guide anyway? A style guide or style sheet is a tool of the trade for professional writers and editors, and something that some of us get quite excited about. I’ve spent many happy hours compiling them (yes, I am a geek). A good example is the Oxford University style guide (for internal use but publicly available): well structured, easy to use and succinct. If you hire a freelance copy editor or proofreader, it’s likely that they will ask whether you have a style guide they can refer to. Check with your communications department. If not, you can always use someone else’s: the Guardian style guide is a popular choice, partly because of its wit as well as its usefulness. The Economist and the BBC also produce style guides that are written primarily for journalists but helpful to other organisations. And If you’re in the public sector, the GOV.UK style guide might be your bible. If you are starting to write your own, it is easy to overload it so try to avoid a brain-dump. Like any set of instructions, a style guide is more likely to be followed if it is simple. These are your choices where there is more than one ‘correct’ way to do something: the collection of decisions is known as ‘house style’. This explains why Oxford University Press uses the Oxford comma in its publications and Oxford University famously does not. These can be quite arbitrary matters of taste: it’s not necessarily the decision that’s important but the fact that you have made one and are sticking to it. Having a house style helps to ensure consistency in what you produce, so that your documents are easy to read and look professional. It also means that your writers don’t have to ‘reinvent the wheel’ for every new document they work on, and have a quick reference guide so they can focus on the message and not the mechanics of writing. For example, Oxford University’s style guide is accompanied by a glossary of University-specific terms and acronyms that is, unsurprisingly, as long as the style guide itself. When you are a journalist, words and phrases specific to your sector could be very broad: anything, in fact, that might be relevant to current affairs. The Guardian style guide includes notes on geography, brand names and popular culture (‘a-ha band from Norway; A-ha! Alan Partridge catchphrase’). I generally keep a style sheet with this kind of information for each of my clients, which tends to grow with each new job that I do for them. NGOs, for example, are likely to have a lot of sector-specific information that I need to become familiar with. One example is how to display numbers. Traditionally (in print), the convention has been to write numbers up to ten as actual words. In contrast, numerals (‘4’ rather than ‘four’) are often used on websites because they stand out more. This kind of decision crosses over into UX (user experience) and tends to be based on research about how people read online. You hire writers because they can write, don’t you? And if not (they might be a subject expert instead), there are always freelance copy editors and proofreaders available. I recently saw a style guide that ordered its readers not to split infinitives or end a sentence with a preposition. Both prohibitions have been continually debunked by usage experts for decades. As a rule of thumb, always beware the word ‘rule’ in discussions of style: it probably isn’t. Style guides or style manual? A style guide tends to be specific to a particular organisation, and short. A style manual can be book-length, and more general. Their existence is another reason why don’t need notes on grammar and usage in your style guide, because they’ve already done the work for you. 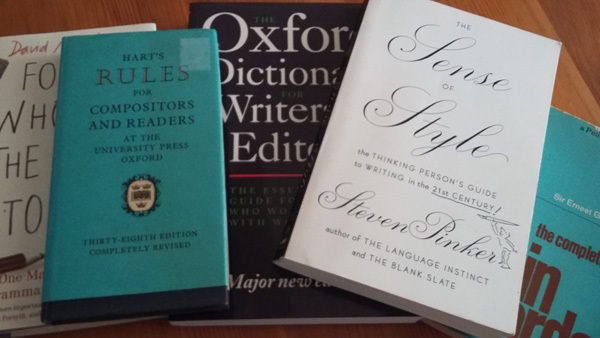 Popular manuals are, in the UK, the Oxford Dictionary for Writers and Editors and Hart’s Rules and, in the US, The Chicago Manual of Style and The Elements of Style (aka Strunk & White). Things are changing. But that’s for the next post.